What is it: The Prototype Concept Competition is designed to push designers to find something unique. It is easy to use a general mechanic within your game design - but hard to make stand out, interesting, or different. 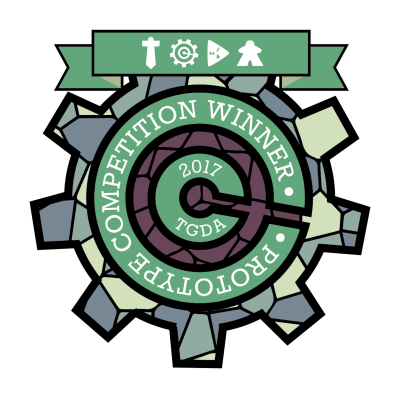 What you get: You will earn a TGDA badge of honour that you can use in future promotions of your game. You will also receive an award. You will be listed on this page as the winner for the year that you entered, and will have a link back to your game/company. What's with the criteria? Being a member of TGDA allows for open discussion, encouragement, iterating and confidence. Being a Patreon supporter is your entrance fee and your support to the group, or you will need to pay an entrance fee into the specified account. There are many standard mechanics, we are looking for one that is uniquely used within your theme/gameplay. Filling out the appropriate competition form. If any of the above criteria are not met, this will disqualify you from the competition. In our five minute video, should we summarise the rules of our game and then say what in particular makes it unique? Can it go 5 minutes and 10 seconds long? No, if it is longer than 5 minutes it does not meet the criteria. Should we worry about comparing it to other established mechanics or games in the genre? The genre is not what we are looking at, purely your mechanic's and how that interacts with your game/genre/gameplay. Do we need to have a playable prototype or is this just the pitch/concept (so long as we have given thought to how it all fits together & will work)? It does not have to be playable, but needs to make sense enough that we can understand what is going on. Can it finish right after explaining the mechanic? How formal does it have to be? Your presentation and formality have no bearing on the final result. As long as we can understand what is going on there will be no problem. Who is the Judging panel? The judging panel will be 5 members of TGDA that do not have an entry in the competition. We will use 5 people to keep the subjectiveness as low as possible and results will be averaged out.